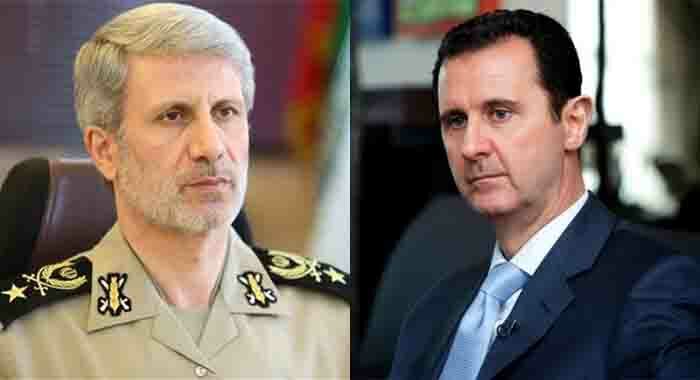 During the meeting with Syrian President Bashar-ul-Assad and other defense and military officials in Syria, Iran's Defense Minister Amir Hatami said, "The relations between the both two countries are reliable and strong and they hope that Syria will be free soon." According to the news agency Tasnim, Iran's Defense Minister reached Syria for his two-day visit where he will meet the senior officials. It is believed that Iranian forces are supporting the Syrian government in the ongoing civil war in Syria. Regarding his visit, Amir Hatami said, "Not only the people of the region but from world are involved in fighting against terrorists in Syria." During the meeting with Syrian President Bashar Al-Assad, Amir Hatami said that 'The Relations between the both two countries are reliable and strong, they hope that Syria will be Free Soon and thus Syrian refugees can return to their homes." On the other hand, Iranian Defense Minister during press conference in Damascus said 'During his two day visit, he also met his Syrian counterpart Ali Abdullah Ayub and discussed the current situation of 'Takfiri groups'. It is believed that Iranian authorities generally define Sunni militant groups as 'Takfiri'. Amir Hatami said that Iran will help Syria to boost its military strength because the Islamic Republic of Iran has a lot of potential capabilities that will help to increase the Syrian military equipment. Last week, The US National Security Advisor John R. Bolton told that Iran should withdraw its troops from Syria otherwise it will face serious consequences. However, the Iranian Defense Minister said that his Iranian Armed forces are present in Syria on the invitation of Syrian President Bashar al-Assad and no plans have been taken for their immediate return. 'Iran will help Syria rebuild and we hope we can play a key role in rebuilding Syria,' he added.